Ozeki, the author of the best-selling A Tale of My Time Being, wrote the preface to the anthology Choices (Borderline Press, 2015). Choices was the publication of Whatcom WRITES! associated with Whatcom READS! Ozeki included twenty writing prompts. They ranged from standing at an intersection in a large city to determine direction to treating every object as if it had feelings. I selected a different one, one the most challenging: staring at my own face for three hours. The Buddha, Ozeki said, sent his students to a charnel to observe decomposing bodies so that they would discover suffering, impermanence, and “no-self.” Ozeki’s goal was more modest. She would practice “immersive attention,” positioning herself in front of the small altar she used for daily meditation. She replaced her statue of Buddha with a mirror. The outcome was a fine reflective essay, The Face: A Time Code (Restless Books, 2016). I wondered…where I would find three unscheduled hours? On Good Friday a responsibility turned into a gift. The responsibility: my wife Amory, and I, two weeks earlier, had volunteered to be present at a labyrinth for a three-hour block of time in case walkers needed assistance. The gift: on the eve of Good Friday, understanding that the time slot was a perfect match for my goal, and so was the place. I sit down on a repurposed church pew in front of a desk. I am in an inner room whose centerpiece is a labyrinth modeled after the one in Chartres Cathedral. I bring up Photo Booth to be my mirror. The screen, no matter how I adjust it, emphasizes slack facial skin drooping into layers of neck flesh. Ugly. I can’t use Word and Photo Booth at the same time, so I prop up a hand mirror between a box of tissues and my computer, pleased to be rid of Photobooth’s unflattering angle. The season is Lent. The Christian calendar calls the week holy, surely the antithesis of my narcissistic preoccupation, and isn’t pride, which just surfaced in the form of vanity, one of the Seven Deadly Sins? Oh well. Today, the scrutiny of my face is my part-time job. It is an odd thing to stare at one’s face. What constitutes the face? The forehead to the chin, I guess, not the ears, not the hair. If my hair receded into my scalp, how far back would my forehead go? Not something I want to imagine. I flip the mirror over to the magnification side, helpful for the application of make-up, the lancing of eruptions and the chasing of unwanted hair. But does anyone like the enlargement of blemishes, the exaggerated creases of wrinkles, the redness of nose, the little puckered gathers above the lip that bring to mind dried apple face dolls, or my own limp blue eyes devoid of their former sparkle? I remember the first time, I took notice of my nose and chin. I opened the medicine cabinet, the mirror swinging so that the adjacent mirror over the washbasin, displayed my profile––a big nose and a receding chin—not a positive self-image for one’s entrance into adolescence. Eventually, I accepted the dimensions of my nose. Besides, when I found my three biological siblings, we took pictures of our similar noses and I felt part of a tribe! I’ve always thought that a serious face reflected intelligence, but my serious face in the mirror looks dour, possibly sour. Most mornings I wake up on the proverbial Wrong Side of the Bed. I’ve learned that if I smile, even mechanically and for no reason, my bad mood dissipates. I think I’ll smile more. My friend Pam wears a bracelet that says Run Happy. I’m placing an imaginary bracelet on my wrist that says Look Happy & Write Happy. Looking in the mirror, the pose I like best is me, head down, staring over purple-blue glasses, hand over my mouth with pointer finger and thumb making a “V” and covering the diminished border between face and neck. Never mind that the speckled backside of my hand has erased youth. It’s interesting to generate a tight-lipped smile by creating chipmunk cheeks, forcing a thin parenthesis of a dimple on my right cheek. My biobros both have superior dimples that transferred, in concert with my former husband’s dimples, to several of our children. A woman, peripheral vision alerts me, comes to walk the labyrinth. I want to look her way because isn’t looking at a person one way we discover something about a stranger? My wife is sitting on the floor in a fort of pillows and will attend to the walker’s needs. I decide to walk the labyrinth when she leaves. Amory and I have a surprising intimacy across the room, wrapped as we are in quiet, similarity of purpose, and the bond of music. The organist is practicing for the evening service, a concert, we feel, that is just for us. No one else is in the church. I look up. The woman stands with her eyes closed, her palms upturned, then leaves. One should pad along on the path of prayer with a meditative heart. Three hours have not yet elapsed. I have to hold the mirror. The surroundings swirl like a jerky documentary movie, but I am happy when I get to the center because I have met my goal. I resolve that my next walk will be undistracted by a physical mirror because I shall move freely through the ancient circles and spirals that mirror nature and spur reflection of a different kind. Wonderful! 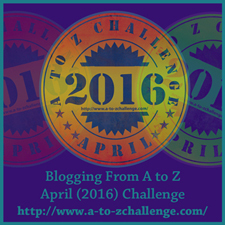 You’ve begun this A to Z challenge. And, most interesting to me, you gave me a sense of what you experienced in your reflective three hours. Thanks for sharing those thoughts so generously. I love this post, Linda! Both funny and profound.